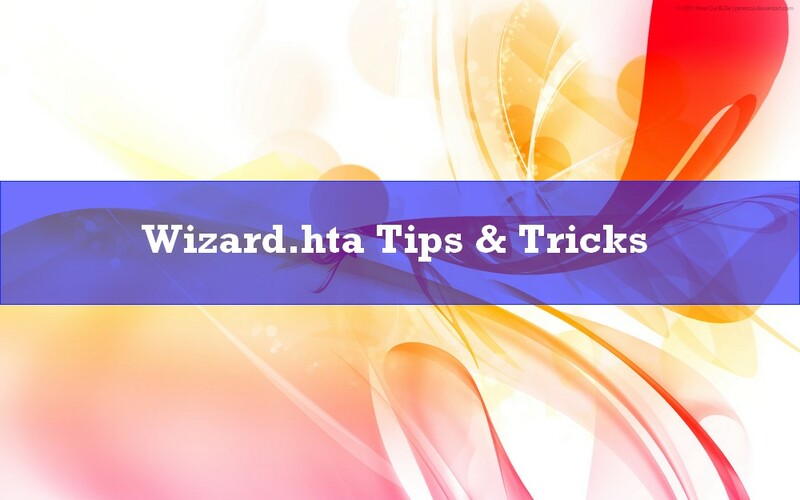 Your deployment wizards are displayed through the Wizard.hta file. This file loads all XML files. You can find here below, some tips and tricks not very technical but which could be helplul. The wizard size can be modfied using the window.resizeTo part. Then you can as instance divise the header in two parts. To modify the main part area search the "MyContentArea" part. The navigation pane is used to display all steps about yourdeployment. To modify it, search the "MyNavigationArea" part. To modify the footer area, search the "CommandArea" part. Change the header backgroun'ds and icon. Search the part src="header-image.png". Then replace this one by the expected picture or background color. To modify the icon, search the src="Computer.png" part, then replace this picture with the good one. Then the header will be displayed without title. You cana also add a picture by replacing the background-color part with style="background-image:url(votre_image.png).